Is anyone else still having trouble with blogger? This post was supposed to go out last week! And most of my post was deleted and the photo removed. Oh well, it could very easily be operator error! Beautiful Sarah Spurr is finished! This is a record for me, slightly over a month to finish her. After all she is a smallish design. I've ordered a frame from Lynn's and as a treat to myself, I'm having them lace it for me. Hello from frigid Wisconsin........it's -3 degrees this morning. Between 19" of snow in December and now the super cold Canadian temperatures, it's turning out to be a winter for the record books! Where is global warming when you need it?!? 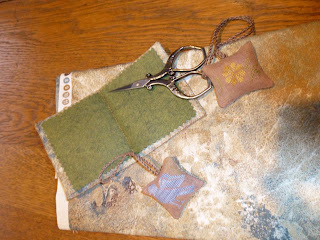 Of course, the positives are lots of indoor time for stitching and reading. I'm making nice progress on Sarah Spurr by Carriage House. Sarah has been an enjoyable stitching experience. 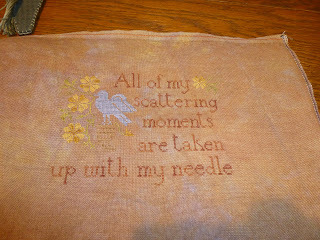 I love the Needlepoint Silks that I'm using. I love her dress and the little detail just to the left of the woman.........my camera won't take a good close up of this, but trust me, it's very pretty. Unfortunately now I'm thinking that I should use more silks than DMC or Anchor floss. My poor pocketbook! Here's my progress so far. I should be working on my challenge piece for Nicola's Scarlet Letter Challenge, but haven't started it. 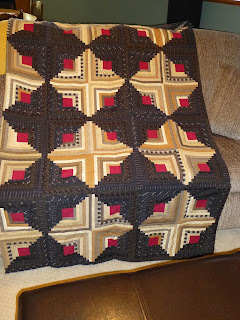 Lots of gorgeous sampler posts taking place on the first and second blogs. Check it out. I did make a tiny start to my Ann Bowers Sampler. It's a stitch along with the Attic in Arizona. I'm already behind on this one....but that's no surprise. The Rocky Mountain Sampler Guild has an ongoing project this year. 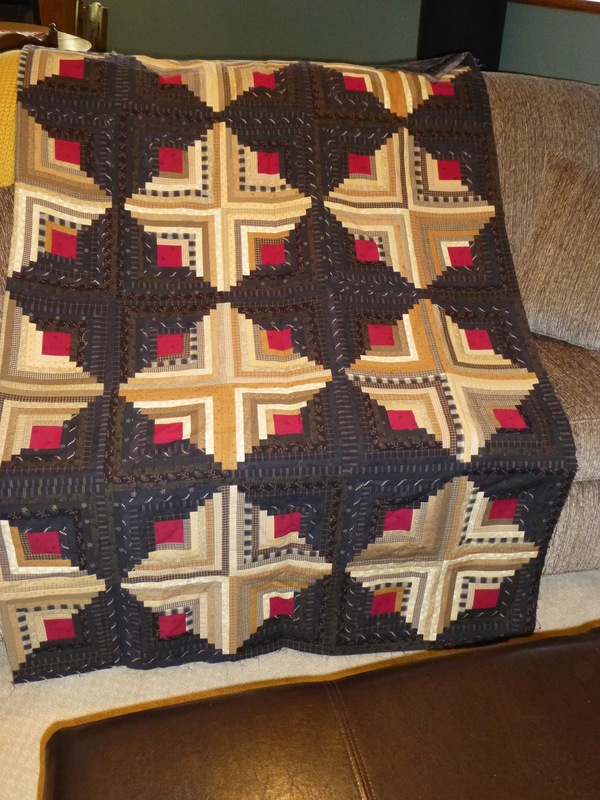 Katrina and Judy started us off with an adaptation of a free pattern from Paulette Stewart. 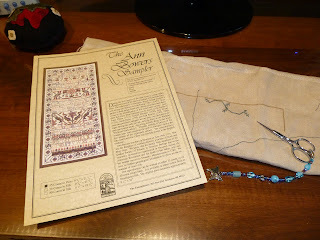 The small sampler will become the top of a stitching box. 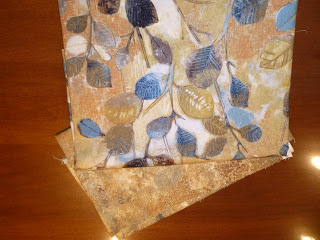 Judy and Katrina supplied fabrics for the lining of the box and backings for the smalls, but I picked out the fabrics shown above. 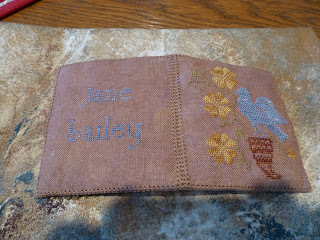 I've enjoyed stitching on all the small pieces to this project. Here is the box top (the box is on order!). After taking this picture, I've decided to rip out the little basket under the bird and restitch it in a darker color.........you can't even see it! Here is the outside of the pretty needlecase. Now, I'm not a great finisher, but with the great instructions that Katrina and Judy supplied, I was able to accomplish this with no problem. Sorry for the shadows........I need to find a better place to take these pictures! Here is the inside of the needlecase, a scissor's fob and the small bird will become a floss keep, once I add a metal ring to the cording. I loved the idea of pinking the edge of the felt in the needlecase, think it added just the right touch. 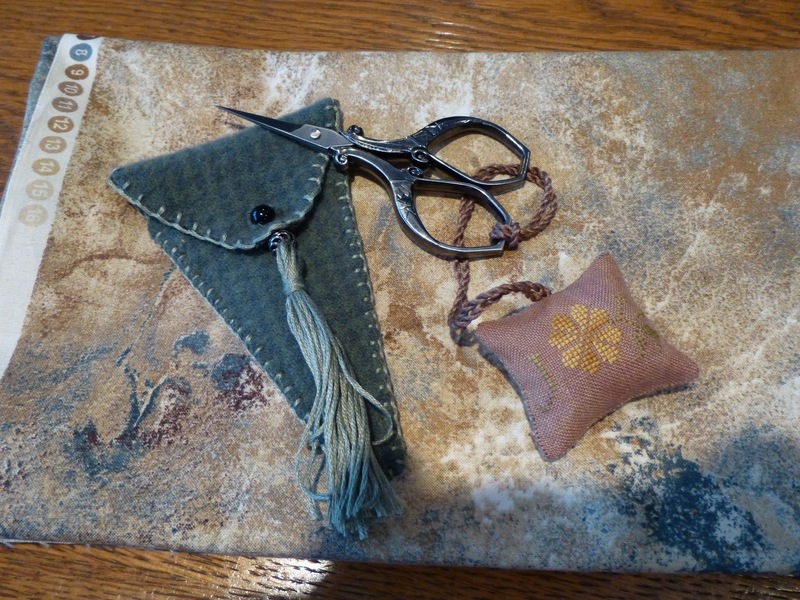 At the December guild meeting, the "table gift" was a kit to make a scissor's case to go with the rest of the accessories. Believe it or not, it really is green, not blue, and it looks wonderful with the rest of the items. My horrible, terrible, oops, wonderful daughter Jen, talked me into doing a Christmas Eve start. It was hard to decide which project I should start, as I have so many WIPS at the moment! On December 4, Paulette shared her sampler exchange piece with her mother. 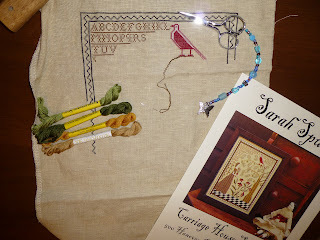 She had stitched Sarah Spurr by Carriage House Samplings. I loved all the red in the piece (she changed colors and used AVAS silk), so I added this pattern to my hoard......I mean stash. Jen and I changed a few of the NPS colors that the pattern called for and off I went! Jen has also convinced me to join a stitch along with the Attic starting at the beginning of the year. We'll be working on The Ann Bowers Sampler by The Examplarery. This will be my New Year's start. Oh, great, now I'll have two more WIPS. I really have joined the nut house! I'm really rather excited about the items we will have for the drawing at my EGA chapter's show in late October. Many of our members donated their time to stitch up these beauties. 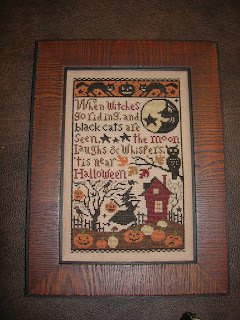 Since I'm a sucker for Halloween, we chose a Prairie Schooler pattern, When Witches Go Riding. 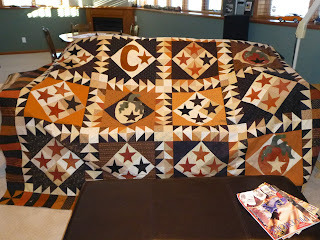 Audrey, Mary Jo and Sandi worked on this piece. I purchased a frame at Lynn's. 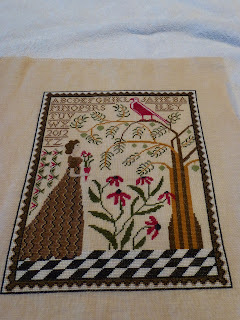 I worked on an old pattern "A Walk in the Woods" and finished it up recently. Here it is completed, also with a frame from Lynn's. Eek, I need to work on my photography skills! The frame looks really boring in the picture, but honestly it's much nicer in person. 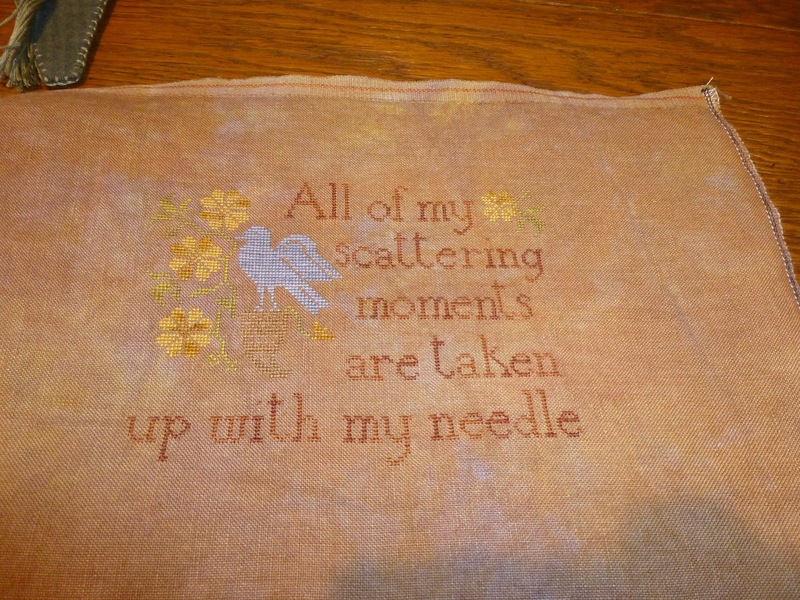 I actually hated stitching on this one since I had made so many mistakes when I first started this project many years ago, but by the time I was finished I was sorry that I was donating it. Guess I'll just have to buy a lot of drawing tickets and hope I win it back. It would look wonderful in the new half bath in the basement! 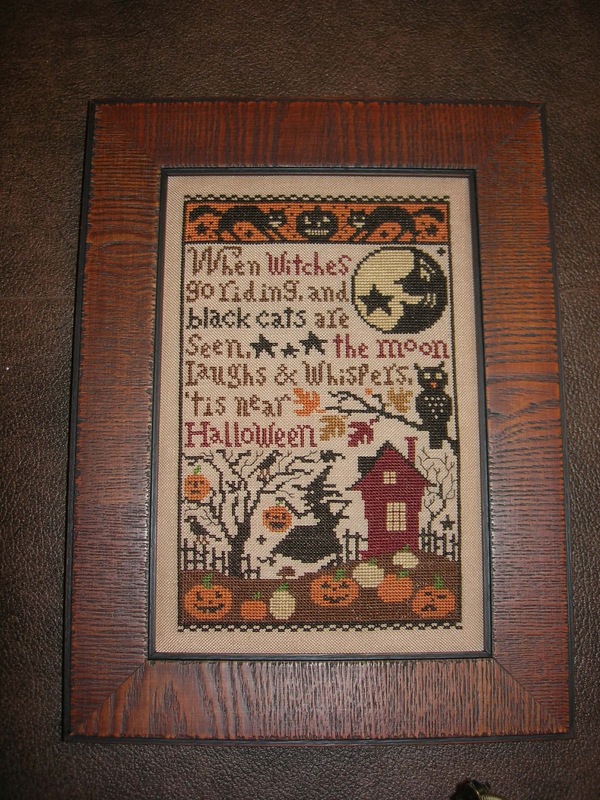 The drawing has two more cross stitch pieces. 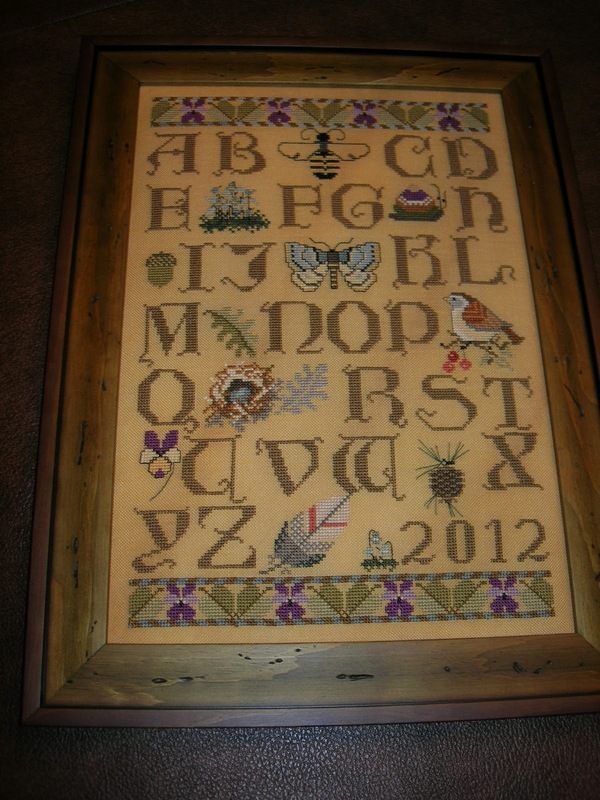 My co-chair, Mary Jo, has made a beautiful four season sampler that she made into a bell pull. I don't have a picture of that but it's wonderful. 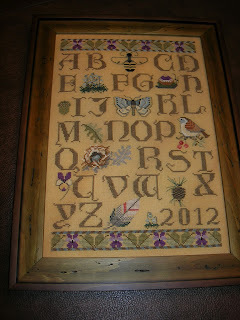 Our chapter president, Sandi, has finished a Christmas cross stitch. I will share a photo of it when I have it framed. 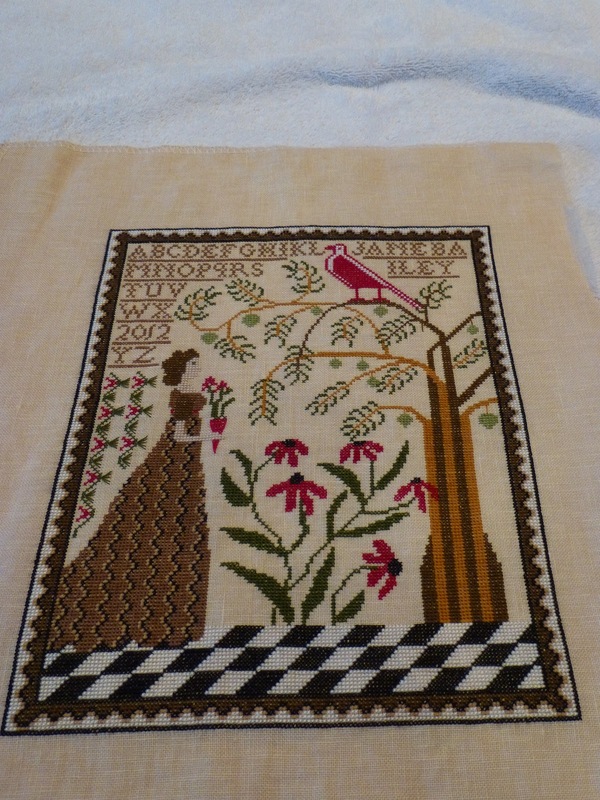 The other group project that is going into the drawing is a hardanger runner that the Hardanger Interest Group worked on........Gerry, Diane, Kathie and Jane.....many thanks ladies! And, Sandi donated the kit! 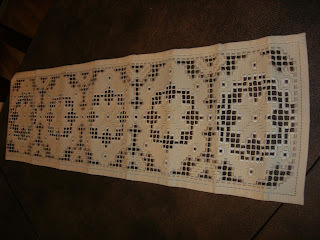 Do you notice that the design on the end of the piece looks different than the middle of the runner? 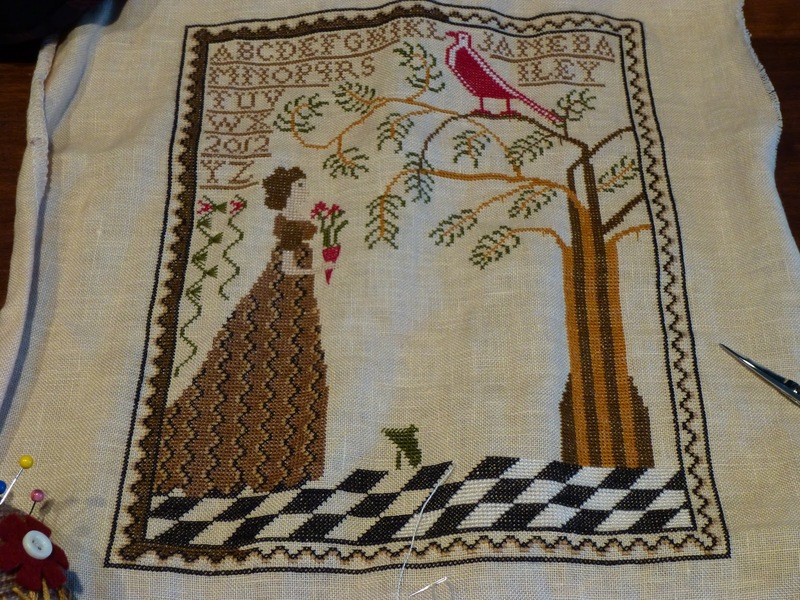 I'll let you in on a secret.........I accidentally cut the wrong threads on the very last motif! Yikes, was I upset. 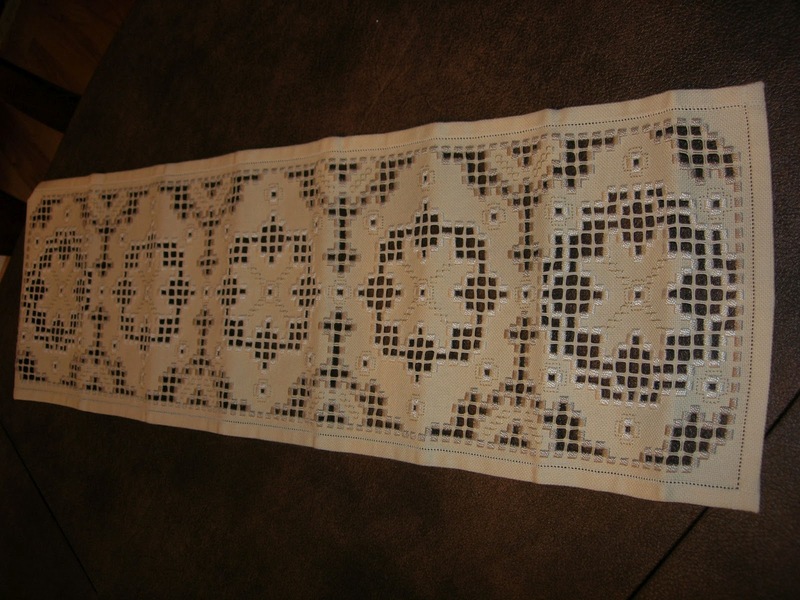 Our hardanger interest group came up with a solution and I added more needleweaving to the outside of both of the end motifs. I not going to admit to anyone that I totally messed up........oh, okay, guess I just did that, didn't I? It's been a crazy summer in Wisconsin with all the heat that a majority of the country is suffering from. We finally have pleasant weather that doesn't take your breath away, I've opened the windows and am enjoying the fresh air. Hurray! We've been having some construction going on in our home for almost three months. Originally we were going to make a simple room in the basement so that I could have my projects, supplies and office space. I'm not sure how we changed, but it is now a multi functional space that we'll use to entertain in as well. Guess that means I'll have to keep things tidied up a bit! Here's an early look at the space. You might be able to see that we've opened up part of the stairway wall on the right. 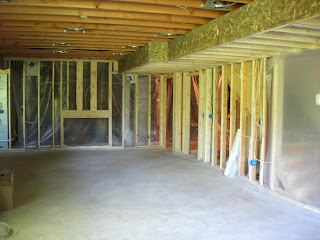 This is a view towards the entertaining portion of our basement. The room is shaped like an L, with my work space in the short end of the L. Here's a view where it begins to take more shape. 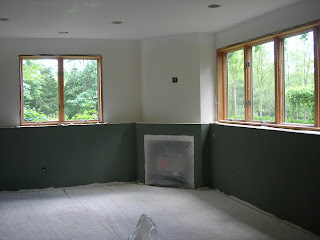 We actually have a bit of drywall in this photo. This area is opposite the space in the previous picture. My work space is to the left, out of the picture. 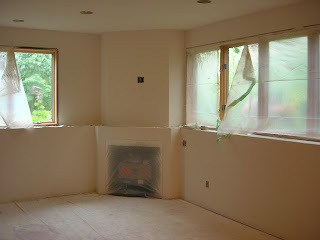 We've come a long way since this photo.........paint, tile and most of the trim work is now completed. If you've ever done any remodeling, you know how frustrating it can be. We had several things which didn't come in on time or only partially came in; the plumbing company sent the wrong sink, etc. You just expect this stuff to happen, but it doesn't make it any less frustrating. I'll share just one more photo today. The paint is on the lower half of the wall and it's taking shape. I'll post some stitching updates tomorrow. I've been finishing up some items for our EGA chapter's show drawing in October.